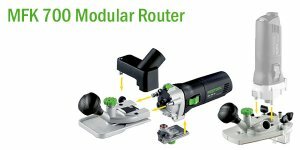 Festool has 3 new tools on the market. The one that has really caught my eye is the new MFK 700 Modular Router. It can go from the standard vertical routing, to horizontal routing with the simple change of a base. This comes in very handy for doing edge banding. You can check out all three tools below, also via their websites.